Courtesy of Kristine I was able to go for the huge T Music Festival concert for FREE! Thanks to Nuffnang for the free tickets and Tiger for organizing this festival too. The parking was not as packed as during the MU Football Players & Shout! Awards. Arrived there half hour earlier and meet up with other Nuffnangers. 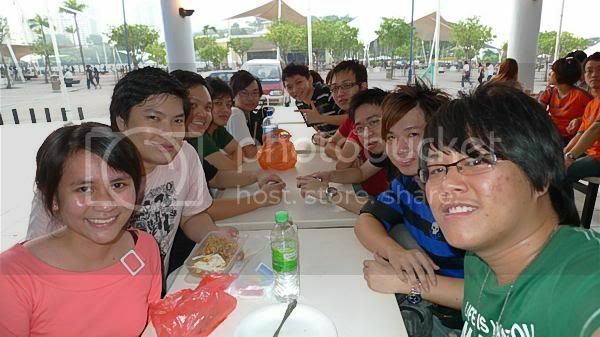 Jacquelyn, Bernard,Simon Seow, Alex, Ren , Jackie, Joshua and more. Guess how many people in the stadium? You can see how far we are sitting now? I guess the power cable is overloaded and too hot and cause fire and sparkling. Notice the guy in the picture taking photo instead of finding way to put off the fire? That's the spirit of _______? All kinds of light emitting props - Colourful! He know how to act cute. Z Chen 张智成 - The pinky guy with more than 10 years of experience being an artist. When his music suddenly gone off, he knew what to do and did a solo without the music. I guess he sang the most among other artists. That night was very hot and lots of artist took of their jacket. David, look at the brightside ! So who is the last singer that complete this show? She took off her jacket too because she said we Malaysians are too ardent instead of "Malaysia is hot". There is one thing I want to tell the artist,"It is not that we are very good to remember all the lyrics for so many artists. It is just because Tiger has already prepare the lyrics on the screen for us XD"
There are more close-up photos from Vista-Crew and JoshuaOng too!